I’m coming to you with another elf review today. This is going to be a review of the elf eye lid primer! I featured it in a haul HERE. I have already reviewed the liquid liner which you can check HERE. Primers are extremely hard to find in my country and bought this off of eBay for about $5 although it costs $1 retail. What elf tells about this primer? This is one of my first eye primers and i had heard great things about this product so was already super excited! I tried it out the first time with a neutral eye look just to see if it lived up to its claims and purpose. My initial impression was that it felt oily on my fingers. The consistency was really funny but I went ahead and tried it anyway. As I spread it over my lids, the oily feeling went off and almost disappeared. The shade I got was sheer so it’s supposed to go according to your natural skin tone. Do the shadows last longer? Yes it did considerably than applying it without a primer. 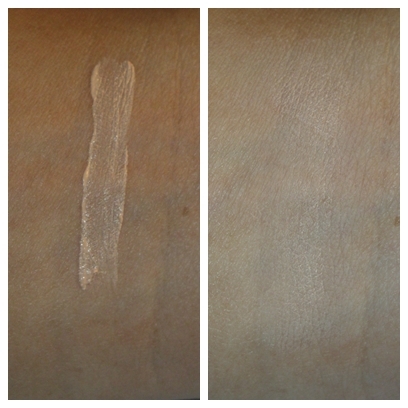 This primer has a consistency to grab the product rather than being powdery so it did keep on the eye look put. Did it make the eye look better? Exactly. I cannot complain but it did. I have a picture below to prove this to you. Scent: it had a funky scent to it which you can definitely recognise but not when you apply it on your lids so not a deal to think much of.